1. CS Insiders: You grew up in Cairo. How did you get recruited to Princeton and navigate the process of preparing international forms and applications? I went to a British school in Cairo and when I was 10 played my first international junior tournament, WGC in Welwn Garden City (a warm-up to the British Junior Open and I think they only had it that year because it was much stronger than the Scottish Junior Open). I played in the U12 and finished 2nd to Peter Barker, one of England’s best players and was a regular on the top 10 PSA ranking list for a while. Since then, I would play 3-4 junior tournaments a year (the British, the German, the Dutch and then a 4th depending on where I wanted to visit and explore). I wasn’t aware of the US recruiting system nor was I interested in in studying in the US. But I was definitely interested in studying abroad, given all my travels as a top junior squash player. I though the UK would be a good fit given it top notch schools, the fact that I went to a British school guided by the British Circular, England’s status as squash power house and finally, its relative proximity to Cairo. 2. CS Insiders: What was the impetus for attending university in the United States? Was your journey self-guided? Was it always a dream of yours to attend school in the U.S.? As we all continue to realize as we get older, many of the best things that happen to us are completely unplanned. I hardly knew anything about Princeton other than the fact that it hosted the World Junior Squash tournament Under 19, a tournament that I did not play in but several my older Egyptian teammates did. They raved about how beautiful campus was and mentioned something about Einstein studying or working there. I thought it must have been cool but didn’t think twice about it. I was set to study in the UK, perhaps University College London. But one day my father told me that he was speaking with a childhood friend of his living in the Philly area and this friend insisted that I apply to Princeton. (US colleges require applications 4-6 months earlier than their UK peers). Coach Callahan and I connected and I managed to put in an application in time for Early Decision and it worked out. I then visited Princeton two weeks after submitting my application and fell in love with the place and thought everything about was so cool. I didn’t apply to any other school. 3. CS Insiders: How prepared were you academically for a top university? What challenges did you face? I went to a school in Cairo where all my classes were in English so the transition as an international student wasn’t so bad. And given my travel for squash (and perhaps all the fun I was having) I wasn’t really getting home-sick. Academically, the toughest aspect was writing at the Princeton level. The IGCSE program hardly requires any writing as it is more test based even in disciplines such as History. So writing papers was tough. Nevertheless, I majored in philosophy although I didn’t feel comfortable writing until I got to my senior year. Also, I think time management academically was a learning process Freshman year. There is so much to do and if you’re an athlete and you’re social, you don’t have time to read everything so you need to be efficient and decide what to focus on – this took time to figure out. Otherwise, I enjoyed my time academically – I was all about the liberal arts with a focus on philosophy and politics. 4. CS Insiders: What was your experience like playing college squash? Honestly, more fun than I ever imagined. First, I loved being on a big team with an amazing group of smart, fun and competitive guys. And we were close with the women’s team as well so it was just a great dynamic all around at practice, at matches and socially. The level of college squash was very solid too. Each year had something special about it. Loved competing against other schools and playing in front of friends and representing Princeton. Fond memories. 5. 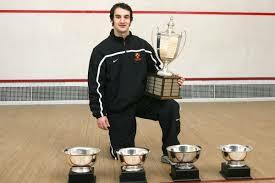 CS Insiders: Why did you choose to play college squash and not go pro right after high school? It wasn’t a matter of college squash vs. pro but rather my aspiration to go to the best college I could attend. Skipping college for pro squash wasn’t in the cards. When I was a senior, I wasn’t sure what I wanted to do post-college and I knew I loved playing squash so I played pro for two years. But I was always looking for what’s next and never got into it. I think pro squash can be a tough career decision and you need to really, really, really want to do it to pass on an opportunity for a college experience, regardless of where it is.